Performance measurement of asset management systems remains a poorly understood area both in terms of industrial practice as well as academic research. 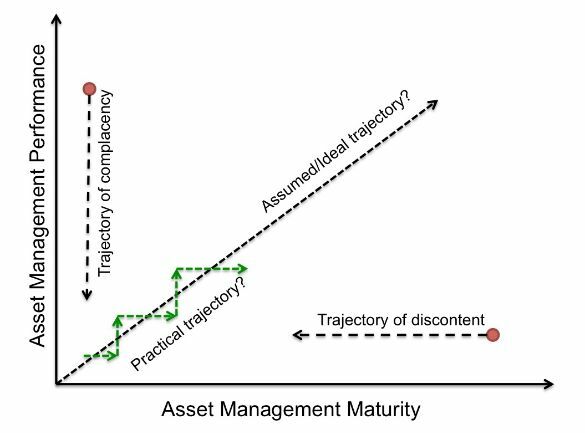 Continuous improvement of asset management systems require a robust performance measurement system that will allow organisations to understand the performance of various elements within the asset management system – thereby ensuring that (i) organisational KPIs and targets are achieved; and (ii) corrective actions in terms of “fine tuning” those elements of the asset management system that are not performing well. The objectives of this project were to develop a performance measurement framework that will help identify the key factors that need to be considered in developing a performance measurement system for asset management systems. Our research have revealed that few asset management performance measures are tracked, recorded and reported. Most companies focus on asset performance measurement, and even here whether these measures are purely down to tradition or more for monitoring performance of contractors depends on the sector and the circumstance. The performance measures did not appear to be linked to business performance, although the power sector was certainly closest of all sectors spoken to in linking asset performance to business performance. Moreover, most organisations focussed on asset management maturity assessment, and not so much on asset management performance assessment. The figure below provides a simple illustration to argue the need to assess performance in addition to maturity. As we found through our literature review, high maturity does not necessarily mean high performance, i.e., the assumed performance trajectory, although an ideal one, is hard to achieve without consistent performance measurement and management. Organisations that achieve high maturity without an eye on performance are in danger of falling off the maturity scale as they find that there is little return for the investment they make in improving their asset management practices. On the other hand, organisations that achieve high performance without a mature asset management system are likely to see dropping performance as they become complacent and the performance becomes unsustainable. The practical trajectory is possibly the one shown in green. When designing a performance measurement system for asset management systems, organisations need to clearly understand the linkages between organisational performance, asset management performance, and asset performance. Organisations’ business key performance indicators (i.e. profit) and asset performance indicators (i.e. reliability) typically allow an organisation to identify the symptoms of poor asset management, but are very limited in terms of helping organisations to identify the cause of performance gap. A good set of performance measures for asset management systems are the connection between organisations’ business performance and asset performance, allowing organisations to understand the causes for poor asset performance and business performance. A good balance between leading and lagging indicators for asset management system performance will also be useful for predictive analytics and allowing preventive actions (e.g., improve the personnel training program) to be taken to improve business performance. The performance measures for asset management need to have a clear link to organisational performance measures, so that the KPIs are aligned. Wang, J., Hou, D., Parlikad, A.K., “Evaluating the effectiveness of performance measurement systems for engineering asset management using performance data,” In Proc. 21st EurOMA Conference, Palermo, June 2014.